Sopheap “Sophie” Saong was born in Wisconsin to loving Cambodian parents. She moved to Seattle at a young age and continued to live in the Pacific northwest. Her family and her pets were her main priority, her second was her friends, and her third was her job working as a human resources analyst for the Secretary of State in Salem, Oregon. She was extremely active and especially loved to play soccer several times a week for NetRippers FC in Portland, eventually becoming the board treasurer for the organization in January of 2018. Sophie was always ready to go on adventures and experience life to the fullest. I was her fiancé. 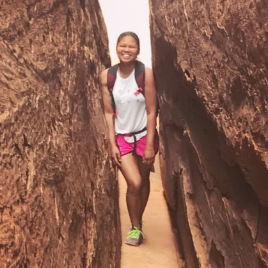 She died unexpectedly from a hiking accident in Arches National Park in Moab, Utah. She was never alone. I never left her side. Sophie cared for and unconditionally loved those around her without hesitation. Her smile lit up any room and her charm was irresistible. The joy she spread was absolutely contagious. Her passing has been shocking and devastating to so many, but treasured memories shared by those who knew her continue to keep her bright, selfless, and beautiful spirit alive. Healgrief has a memorial to share with you. https://healgrief.org/sopheap-saong/ We invite you to express condolences, share special memories and photos and light virtual candles to honor and celebrate the life of our loved one. We also invite you to share this with others who may want to be notified as well. You may do so by sharing the link or by clicking the “Share this Memorial” button from within the memorial itself.